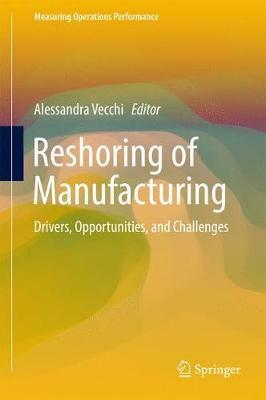 This book examines key aspects of the increasingly important phenomenon of reshoring - the decision of companies to reverse offshoring by bringing manufacturing back from overseas. The aim is to equip readers with a full understanding of the current extent of reshoring, its drivers, and the associated opportunities and challenges. The impact of governments' economic policies on the location choices of entrepreneurs in an era of globalization is carefully analyzed, drawing on experiences in the United States and Italy, where contrasting encouragement is provided for reshoring decisions. The effect on reshoring of recent developments regarding technology, the environment, and other factors is assessed in depth, and readers will also find close scrutiny of the relationship between reshoring and manufacturing performance. The book will be of interest to all academics, researchers, and practitioners with an interest in the manufacturing industry and will be an excellent teaching aid for a variety of courses in different disciplines at both undergraduate and postgraduate level.